Throughout history, world hegemons have linked their currency to gold, with Britain creating a gold standard in 1821 and the United States backing the dollar with gold after the Bretton Woods conference. And when Richard Nixon took the dollar, the longtime global reserve currency, off the gold standard in 1973, many criticized our nation for abandoning its responsibilities to the rest of the world. Now it appears that the tides may be shifting. In an editorial in the New York Times, Kwasi Kwarteng introduces the notion of a gold-backed Chinese currency as potentially taking over as the world reserve currency. China has expanded its manufacturing base and captured international markets with a world hooked on its products. Should it peg its currency, the renminbi, to gold, Kwarteng argues that it may be preferable to the dollar as the world reserve currency. With a balanced budget and a gold-backed currency, China’s economy will likely become even stronger than it is today. 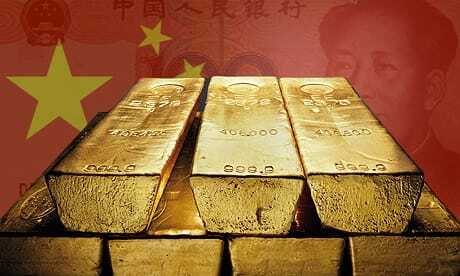 China has the gold reserves to back its currency and economic strength to dominate global monetary policy. Tension in the Ukraine seems to be only intensifying, especially with the recent downing of Malaysia Airlines Flight MH17. Although there is no certainty as to culpability for the attack, the standoff between Russia and the United States moves closer and closer to emulating the Cold War. Such a crisis would debilitate the already fragile world economy, possibly sending it into turmoil. With these potential possibilities, Lawrence Williams of Mineweb questions why gold prices aren’t moving any higher. The bullion market is being suppressed by a banking sector which would find itself in deep trouble if gold prices ran high. However, speculators are being drawn to the possibility of huge gold price escalation looming sooner rather than later due to the he geopolitical fragility between Russia and the United States which is on a knife’s edge and could spiral into a volatile series of economic, as well as political, catastrophes. Despite recent drops in the price of gold, specifically a 2.1% loss just two weeks ago, analysts at Bank of America Merrill Lynch believe the worst days for gold may have ended. A metals strategist at Bank of America Merrill Lynch Michael Widmer explains how gold prices have stabilized this year due to prolific demand from the emerging markets of China and India, who are absorbing mine and scrap supply, which has offset any selling from skittish gold speculators. With rising nominal rates and falling inflation expectations in 2013, gold experienced a volatile climate with major portfolio adjustments running against the precious metal. Widmer states, “We believe that physical demand from emerging markets will gain further clout in the medium term as countries get more affluent, suggesting the worst may be behind the gold market.” Gold’s movement accompanies that of inflation, and with projected increases in inflation, this would lend even more credence to the belief that gold is set to rise.